TVs are getting bigger and the stands they come with are just getting flimsier. DON'T WORRY, ECHOGEAR TO THE RESCUE! Sorry, we were just testing our opening for our new infomercial. 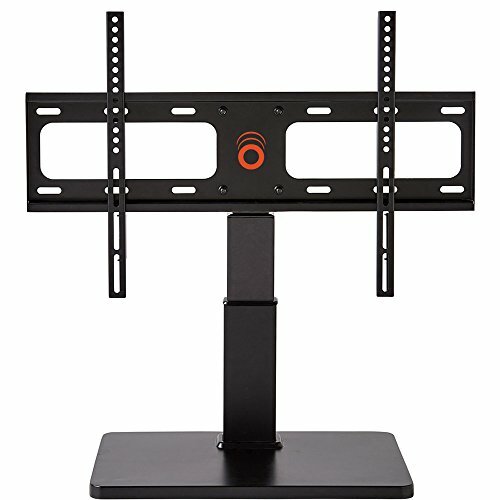 The ECHOGEAR TV stand is a great solution to maximize your TV viewing experience. Get many of the benefits of mounting a TV, without drilling holes in your wall. Sound difficult to install? Think again. With a quick 15 minute assembly, you can get back to the chill part of your Netflix marathon quicker. That's right, we're hip (or whatever the kids say these days). We've designed this TV stand to be compatible with almost every TV out there, and included a ton of screws to ensure you have the right fit. Buying from ECHOGEAR means you get an awesome product at a great price. We back up everything we sell with our US based customer support that is available 7 days a week. With ECHOGEAR, you will be satisfied, or your money back. Not everyone knows they have the option to replace their crappy stock TV base. When describing your awesome new ECHOGEAR stand to your friends, feel free to use words such as tabletop swivel stand, revolving TV stand, turntable, replacement TV base, freestanding TV mount, or dope metal TV holder thing. So go ahead, improve your TV watching experience with a new TV stand. You'll be glad you did. This universal TV stand has it all. 15-minute installation, 75 degrees of swivel, 4 inches of height adjustment, and added TV stability for screens up to 60lbs are what keep Echogear customers coming back for more. We pride ourselves on delivering the best possible experience for our customers. Therefore, this TV stand requires only 3 simple steps to be assembled and safely holding your TV (in 15-30 minutes). See just how easy installation is in the content below. Improve the viewing angles in your space by swiveling the TV left and right and adjusting the height at which the TV sits. No matter what seat you're in you'll have the best angle to catch all the action. Our instruction manual and hardware pack are outlined and labeled for an easy to follow process. US-based customer service is also available 7 days a week, excited to help you finish your project and answer any questions. The stands that come with your TV just don't compare. Not only do you get these features, but this TV base provides more safety and stability. Worry-free TV watching is the best way to watch TV.